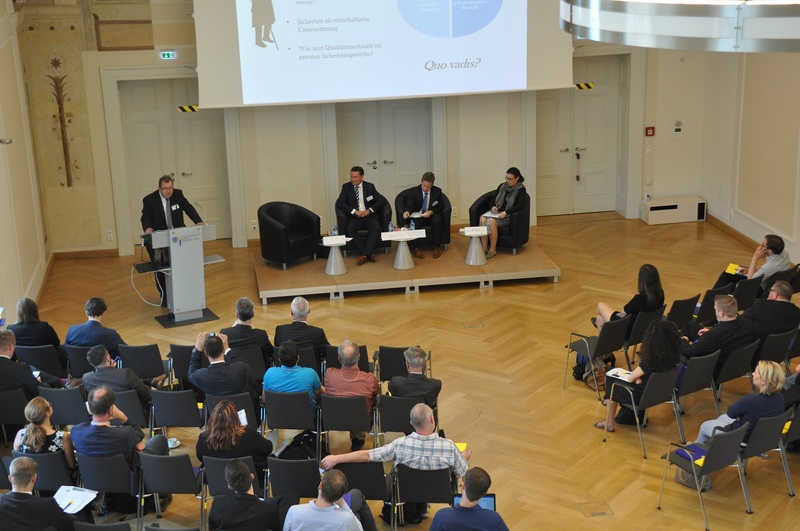 From 24- 25 May, the 18th FORSI Security Days took placed at the European University Viadrina. This event was organized for the third time in cooperation with the Federal Association of the Security Industry (BDSW). For this reason, the Research Department for Enterprise Security and Security Economics (FORSI) invited speakers from various sectors to discuss current security issues, the challenges and its development. 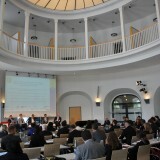 At the age of majority, the event was redesigned and one of the four panels was held in English. Together all the participants wanted to achieve a discussion about the current status and practical experiences. 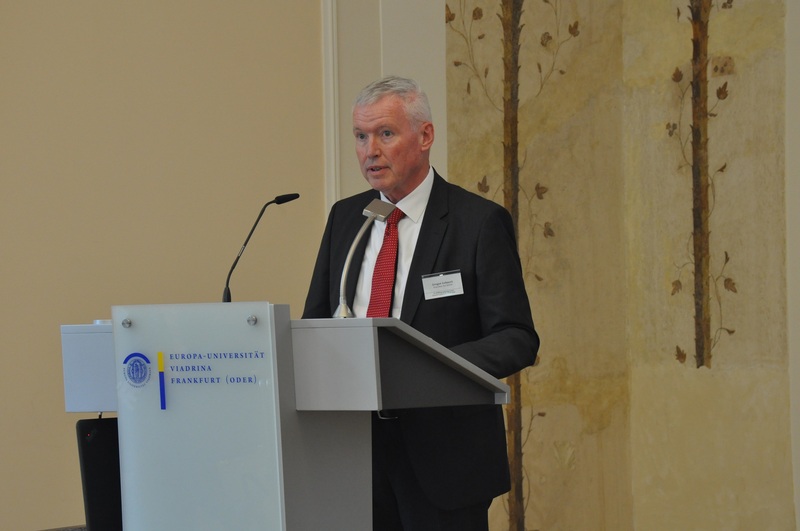 Prof. Dr. Stephan Kudert, president of the European University Viadrina, welcomed the guests and emphasized the special importance of the work of the research department for enterprise security and security economics. He joined the words of welcome from the Federal Minister of the Interior, Horst Seehofer, and wished the participants and speakers a meeting with as much exchange of experience and ideas for the future as possible. Gregor Lehnert, President of the BDSW, welcomed the guests next and in his speech he highlighted the importance of equal safety and quality standards. 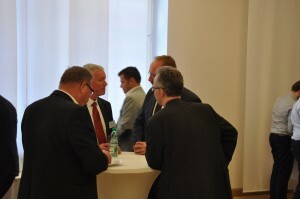 Prof. Dr. Bartosz Makowicz as the organizer of the event also welcomed all guests, participants and speakers. For the two days, he wished everyone a successful meeting with impact on the future. 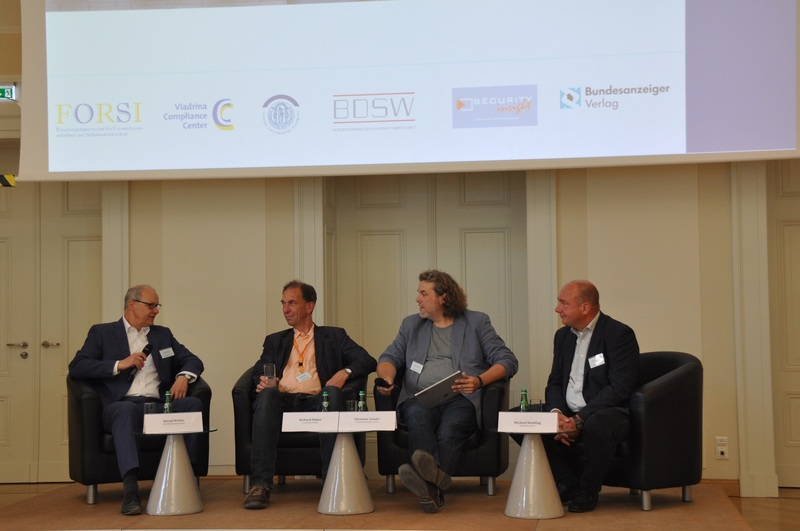 "The security company of the future: quality and reliability"
The first panel of the conference was moderated by Prof. Dr. Sven Eisenmenger and he gave the participants a detailed insight into the current situation and the challenges of the security industry. Marco Wilde, as a representative of GSE Protect Berlin, referred above all to the practical experience he has gained. So he took up the fact that it is difficult for the customer to recognize the form in which the private security companies meet quality characteristics. It is only recognizable by markings on the respective products. He also referred to the fact that the demands on the security industry are growing steadily due to the fact that social changes take place and thus create new areas of tension. In his opinion, the right interaction between the private sector and the state is essential for securing quality-creating factors in the private security industry. René Land from the Cottbus Trade Office was the next speaker and he initially referred to a December 2016 reform that requires entrepreneurs to need expertise and regular reliability audits. He also commented that he lacks a nationwide regulation and legal basis for fields of activity that are identical. 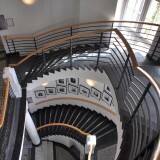 He also commented that at the beginning of 2019, the German guarding register is expected to provide nationwide centralized storage of data on security guards and companies, and how he assesses this. Finally, Mona Mohrat from the German Chamber of Commerce and Industry e.V. talked about the process and the prerequisites of the competence examination, that is taken through the responsible IHK. In doing so, she pointed out that renewal had taken place in the sense that, above all, intercultural competence, with particular attention paid to diversity and social diversity, was taken into account. 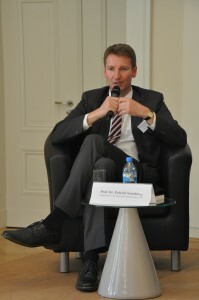 Prof. Dr. Patrick Sensburg spoke as a Member of the German Bundestag. In his speech he talked about the developments in the IT sector and the problem of hacker attacks in companies. He also pointed out that, despite the necessary innovations, everyone should reconsider their communication, which in turn carries some dangers. Dealing with data in the digital world is a matter that should not be forgotten despite the rapid development. He also emphasized the importance of the corresponding combination of Human Intelligence and Signal Intelligence. In his opinion, ensuring security can only be achieved through cooperation between the state and the private sector. "New risks = new tasks for the security industry"
The second panel was headed by Prof. Dr. André Röhl of the Northern Business School. Initially, he referred to the degree program in Security Management and the demands and framework conditions that the future demands of such programs. 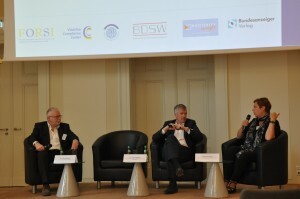 Gregor Lehnert, president of the BDSW, pointed out at the outset that the new dangers in the security industry are not just a snapshot and a common phenomenon is that cooperation in the security industry is questioned only after a negative event has occurred. Security agencies have to keep getting ready for new things, and not everything can be recognized in advance, given the speed of development. The number of business areas is growing and this requires training to sensitivity. In his view, a purely advisory activity alone is not sufficient to be prepared for the new dangers. 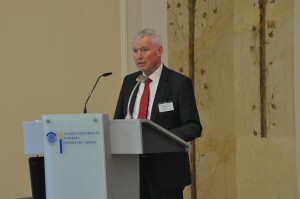 After that, Mario Faßbender from the Brandenburg constitutional protection team tied to the keynote. He asked the question whether every company was able to recognize the need for action in the field of security economics. Above all, Germany is characterized by medium-sized companies and these companies do not give enough thought to this topic. He also referred to the initiative of the Federal Office for the Protection of the Constitution, which is a common platform for informing about, for example, new danger trends. He also brought privacy and current challenges to the discussion on the basis of the Data Protection Regulation, which came into force on 25 May 2018. Prof. Dr. Patrick Sensburg also participated in this panel as a political representative. He judged the development to be more and more private actors. This implies the need for more government intervention, with the government focusing more on some areas. 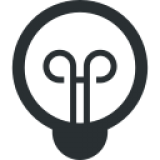 However, to make this possible, the relevant ideas from the industry are needed. He also considered it particularly important that companies should deal more responsibly with data obtained from technology. Above all, he views the input from the industry as promoting policy, in order to jointly achieve the best possible solutions. At the end of the event, Prof. Dr. Bartosz Makowicz summarized the lectures and discussions in a total of six theses. It was the development of new fields of activity, which are constantly becoming more and more complex. He also addressed the discharge of public actors by private actors. It was also recognized that lawmakers are being called for and, last but not least, there is growing tension in the security industry. 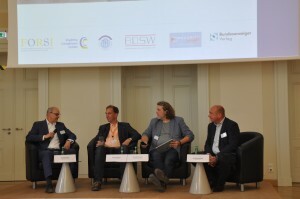 The second day of the event was opened with the third panel under the descriptive moderation of Christian Zander representing freedom manufactory GmbH. Bernd Weiler from SECURITAS Germany kicked off with his announcement of the latest trends in the security industry. 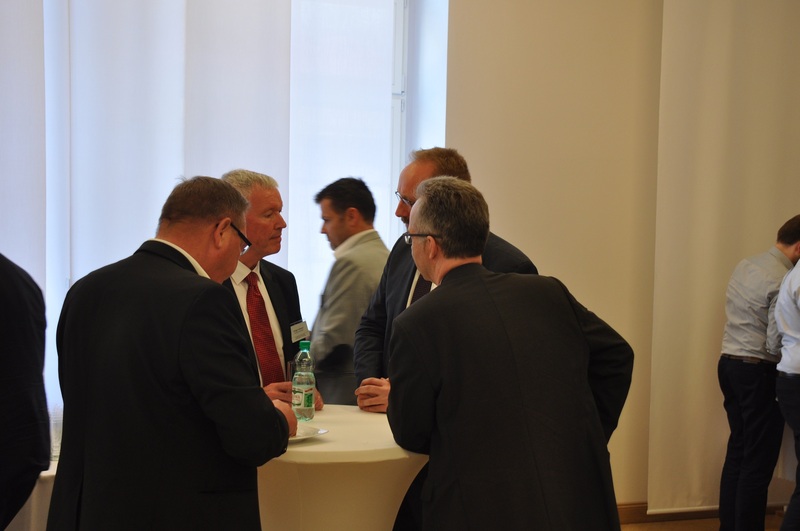 In addition, he allowed the guests of the 18th FORSI Security Days to get an overview of the work of this company and which security services are currently most in demand on the market. The future is shaped by technology and he pointed out that efficient solutions necessarily mean investing in technology. Nevertheless, a good combination of people, technology and alarm system should continue to be created. This was followed by the presentation by Richard Huber from Fraunhofer FOKUS, who was mainly concerned with IT security. He emphasized how important it is to understand the potential dangers in order to be able to act properly. He also talked about awareness, which means that a company's employees should be trained to be cautious in order to get a sense of the dangers and how to best deal with them. His talk included some practical examples that served as illustrations. 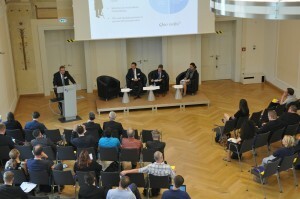 Michael Römling from Bundesdruckerei spoke about cybersecurity and critical infrastructures. He pointed out that particular attention had to be paid to security at KRITIS. However, many domains interlock here, which you have to take special care of. During his presentation, he argued that the requirements of the IT Security Act should be extended and that the proof requirements for concern about IT disruptions could be improved. The moderation of the last and at the same time English-speaking panel took over Dr. Tim Stuchtey from the Brandenburg Institute for Society and Security. He introduced the topic by highlighting the importance of security prevention projects with the accompanying privatization and the cross-sectoral importance of the topic. This was followed by the presentation by Prof. Mark Button, University of Portsmouth, referring to the current situation in Great Britain. There, too, private security companies are being used to fill gaps in the security industry. In his presentation, he presented three common cases, in particular, in that privatization is recognizable in the security industry. For one, this is the case in public patrol. As another example, he cited a quite drastic example that sometimes even private security companies take over the transport of prisoners in the prison. Finally, he went into cheating. Catherine Piana from COESS was the last panelist to address the private security industry in Europe. At the beginning, she talked about the vision and values ​​that need special attention and that should be in harmony with each other. For example, the quality, security, trust, compliance and good cooperation between the individual security sectors. She also sees many changes with challenges, but also opportunities resulting from them. In summary, Ms. Piana recognized that the private security industry in Europe is growing rapidly and that for a secure future there should be a constant focus on the values ​​to be respected. The 18th FORSI Security Days was a complete success and called to the speakers, organizers and guests important aspects of the current situation in the security industry in the awareness. It was made clear that in the future, due to the rapidly developing security industry and the associated dangers, many challenges will be met and one should be able to find possible solutions at an early stage.